Lighthouses were created to protect the ships and sailors on the Great Lakes. All lighthouses were created under the U.S. Lighthouse and U.S. Lifesaving Services Departments. At night, the bright revolving light on top of a lighthouse tower helps sailors avoid these dangerous areas. 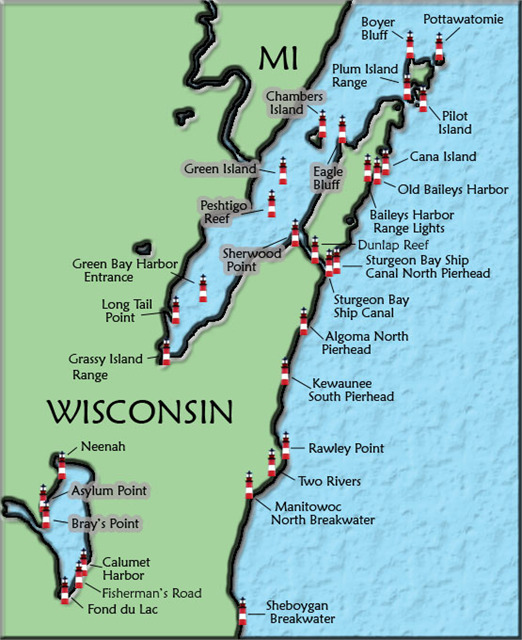 Today nearly 50 lighthouses can be found along Wisconsin's Great Lakes shores. They still light up the night, showing sailors the safe way into port. Although lighthouses prevented some accidents, the U.S. government realized it needed to provide people and lifesaving equipment to help rescue sailors when shipwrecks did occur. 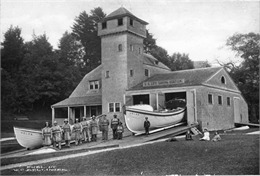 To help sailors in a shipwreck, lifesaving stations were created. They had highly trained crews to watch for and rescue shipwrecks and sailors. Lifesaving crews were very brave, made many daring rescues, and worked at great risk to their own personal safety. Today, the lifesaving crews of the U.S. Lighthouse and U.S. Lifesaving Services have been replaced with the U.S. Coast Guard, who now patrols the Great Lakes. They are always ready to help ships and sailors in an emergency. 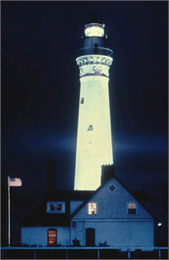 See more images, essays, newspapers and records about lighthouses. 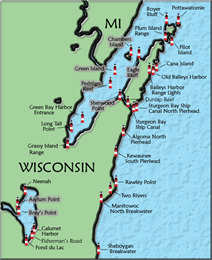 Learn about the Society's Maritime Preservation Program, which preserves Wisconsin's historic shipwrecks. The Lucerne was a cargo ship that sailed Lake Superior in the 1800s. Find out more about the Lucerne and its final fate through this interactive resource, historical essay and slideshow.